With the powerful new PDPM tools built into SimpleAnalyzer™, you can leverage the clinical intelligence within your MDS data to prepare for success under the new patient-driven payment model. 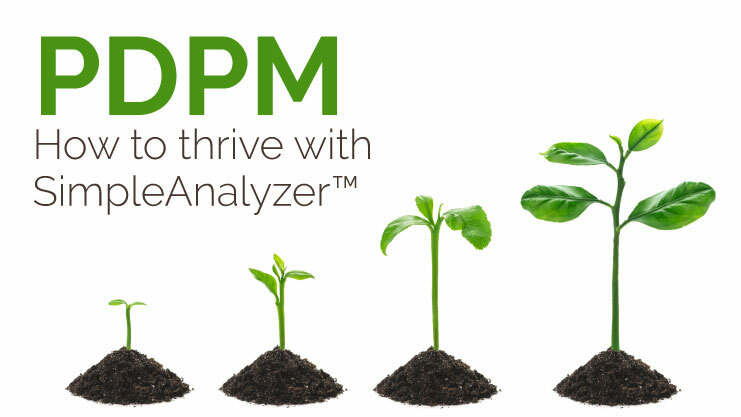 All SimpleAnalyzer™ users have access to the new PDPM functionality at no additional charge. Predict reimbursement levels for each of the five case-mix classification groups (nursing, NTA, etc.) by population. Analyze trends over time and optimize your workflow processes to increase PDPM revenue. View number of residents with invalid primary diagnoses and average case-mix index rates for each facility. Easily compare performance across your organization to identify facilities that need immediate attention. Explore your current MDS data to highlight areas of clinical complexity and exposure to risk. View primary diagnoses, default clinical category, and case-mix index rates for every resident. SimpleAnalyzer™ flags residents missing valid primary diagnoses so you can proactively identify and fix errors to maximize PDPM reimbursement potential. Easily scan for valid primary diagnoses and associated clinical categories, NTA and SLP comorbidities, and surgical eligibility diagnoses. Analyze primary and active diagnoses to ensure clinical compliance and optimize PDPM reimbursement. Over the next few weeks, we will roll out even more PDPM analytics tools and functionality to help you prepare for the upcoming changes. We are committed to providing the best post-acute analytics tools on the market while simultaneously providing software that is both simple and a pleasure to use. In addition to improving our software, we will continue to offer free educational content to prepare you for industry changes. For PDPM training and webinars, check out our PDPM page. SimpleAnalyzer™ is a real-time analytical tool for optimizing and scrubbing MDS 3.0 data, improving QM and Five-Star results, and preparing for PDPM. Its predictive analytics proactively alert you to problem areas, inconsistencies and negative trends so you can correct errors in real-time. Thousands of facilities trust SimpleAnalyzer™ as a critical component of their reimbursement and clinical strategy. With its powerful new array of PDPM tools, you’ll be prepared for success under the new payment model. Sign up for your free demo today. Hi Al – We’ll have someone get in touch to provide more info. Thanks! Hi Sheila – We’ll have someone get in touch to provide more info. Thanks! Hi Nikki – Looks like you’re already on our email list, so you will receive all future product updates as we announce them. Thanks! What software programs is this tool compatible with? Hi Lori – The PDPM tools are a part SimpleAnalyzer™, which is compatible with all EHR systems. We’ll have someone get in touch to provide more info. Thanks!